Metal Garages Direct offers metal garages to the entire state of New Jersey NJ. 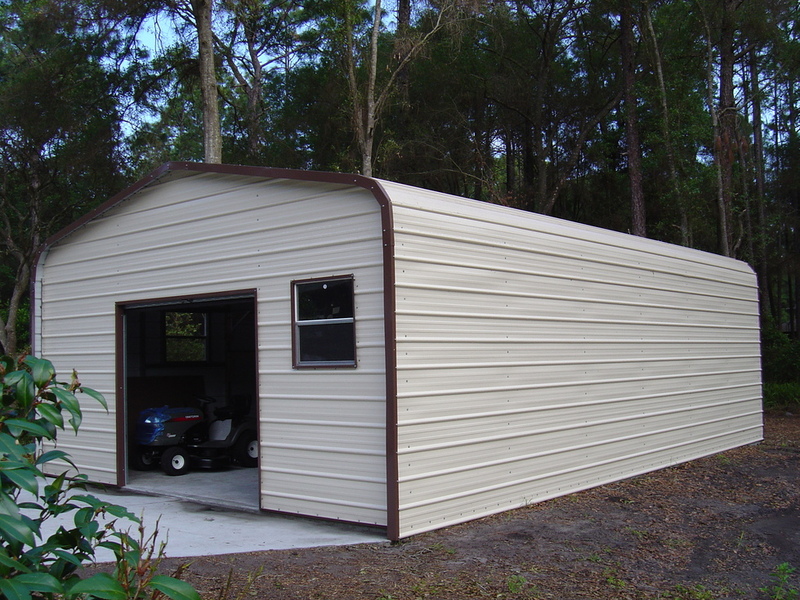 We offer our New Jersey metal garages in many different sizes starting at 12' wide up to 60' wide and as long as you want. Our garages are available in up to 16' side height. Our New Jersey NJ metal garages are available in 13 different colors! In addition New Jersey NJ metal garages are available in both 14 ga(no warranty) or 12 ga(20 year rust through limited warranty) and come standard with 29 gauge paneling, but are also available in 26 gauge(most states). New Jersey steel garages are available in both certified and non certified. We also offer carports, metal barns and steel buildings!Our metal garages are great for storing cars, trucks or tractors. A New Jersey steel garage helps protect your assets from mother natures unpredictable weather. ​Unlike most companies we display our prices for you to see so check out our garage packages below! Our New Jersey metal garages are delivered and installed for free as long as your ground is level. Our normal delivery time for New Jersey are is 2-4 Weeks and up to 8 weeks. So if you are looking for a great metal garage or steel garage at a great price with quality service then give us a call toll free at 1-877-662-9060 or email us: sales@mayberrymetalstructures.com. ​Aberdeen NJ, Absecon NJ, Allendale NJ, Asbury Park NJ, Atco NJ, Atlantic City NJ,Atlantic Highlands NJ, Audubon NJ, Avenel NJ, Barrington NJ, Basking Ridge NJ, Bayonne NJ, Beachwood NJ, Belleville NJ, Bellmawr NJ, Belmar NJ, Bergenfield NJ, Berkeley Heights NJ, Berlin NJ, Bernardsville NJ, Blackwood NJ, Bloomfield NJ, Bloomingdale NJ, Bogota NJ, Boonton NJ, Bordertown NJ, Bound Brook NJ, Bradley Beach NJ, Bridgeton NJ, Bridgewater NJ, Brielle NJ, Brigantine NJ, Brookwood NJ, Browns Mills NJ, Budd Lake NJ, Buena NJ, Burlington NJ, Butler NJ, Caldwell NJ, Camden NJ,Candlewood NJ, Cape May NJ, Cape May Court House NJ, Carlstadt NJ, Carneys Point NJ, Carteret NJ, Cedar Grove NJ, Chatham NJ, Cherry Hill NJ, Cinnaminson NJ, Clark NJ, Clayton NJ, Clementon NJ, Cliffside Park NJ, Cliffwood Beach NJ, Clifton NJ, Clinton NJ, Closter NJ, Collingswood NJ, Colonia NJ, Cranford NJ, Cresskill NJ, Crestwood Village NJ, Delanco NJ, Delran NJ, Demarest NJ, Denville NJ, Dover NJ, Dumont NJ, Dunellen NJ, East Brunswick NJ, East Hanover NJ, East Orange NJ, East Rutherford NJ, East Windsor NJ, Eatontown NJ, Edgewater NJ, Edison NJ, Egg Harbor City NJ, Elizabeth NJ, Elmer NJ, Elmwood Park NJ, Emerson NJ, Englewood NJ, Englewood Cliffs NJ, Ewing NJ, Fairfield NJ, Fair Haven NJ, Fair Lawn NJ, Fairview NJ, Fanwood NJ, Flemington NJ, Florence NJ, Florham Park NJ, Fords NJ, Forked River NJ, Fort Lee NJ, Franklin NJ, Franklin Lakes NJ, Freehold NJ, Frenchtown NJ, Garfield NJ, Gilford Park NJ, Glassboro NJ, Glen Ridge NJ, Glen Rock NJ, Gloucester City NJ, Guttenburg NJ, Hackensack NJ, Hackettstown NJ, Haddonfield NJ, Haledon NJ, Hamilton Square NJ, Hammonton NJ, Harrison NJ, Hashbrouck Heights NJ, Hawthorne NJ, Hazlet NJ, Highland Park NJ, Highlands NJ, Hightstown NJ, Hillsdale NJ, Hillside NJ, Hoboken NJ, Hopatcong NJ, Irvington NJ, Iselin NJ, Jamesburg NJ, Jersey City NJ, Keansburg NJ, Kearny NJ, Kendall Park NJ, Kenilworth NJ, Keyport NJ, Kinnelon NJ, Lakewood NJ, Leonia NJ, Lincoln Park NJ, Lincroft NJ, Linden NJ, Lindenwold NJ, Linwood NJ, Little Falls NJ, Little Ferry NJ, Little Silver NJ, Livingston NJ, Lodi NJ, Long Branch NJ, Lyndhurst NJ, Madison NJ, Mahwah NJ, Manasquan NJ, Manville NJ, Maple Shade NJ, Maplewood NJ, Margate City NJ, Marlton NJ, Matawan NJ, Mays Landing NJ, Maywood NJ, Mendham NJ, Mercerville NJ, Metuchen NJ, Middlesex NJ, Middletown NJ, Midland Park NJ, Millburn NJ, Milltown NJ, Millville NJ, Montclair NJ, Montvale NJ, Moorestown NJ, Morris Plains NJ, Morristown NJ, Mountainside NJ, Mount Arlington NJ, Mount Holly NJ, Neptune NJ, Neptune City NJ, Newark NJ, New Brunswick NJ, New Milford NJ, New Providence NJ, Newton NJ, North Arlington NJ, North Bergen NJ, North Brunswick NJ, North Caldwell NJ, Northfield NJ, North Haledon NJ, North Plainfield NJ, Norwood NJ, Nutley NJ, Oakland NJ, Ocean City NJ, Oceanport NJ, Old Bridge NJ, Old Tappan NJ, Oradell NJ, Orange NJ, Palisades Park NJ, Palmyra NJ, Paramus NJ, Passaic NJ, Paterson NJ, Paulsboro NJ, Pennsauken NJ, Pennsville NJ, Perth Amboy NJ, Phillipsburg NJ, Pine Hill NJ, Piscataway NJ, Pitman NJ, Plainfield NJ, Pleasantville NJ, Pompton Lakes NJ, Point Pleasant NJ, Princeton NJ, Rahway NJ, Ramblewood NJ, Ramsey NJ, Rariton NJ, Red Bank NJ, Ridgefield NJ, Ridgefield Park NJ, Ridgewood NJ, Ringwood NJ, River Edge NJ, Riverside NJ, River Vale NJ, Rochelle Park NJ, Rockaway NJ, Roselle NJ, Roselle Park NJ, Rumson NJ, Runnernede NJ, Rutherford NJ, Saddle Brook NJ, Salem NJ, Sayreville NJ, Sayre Woods South NJ, Scotch Plains NJ, Secaucus NJ, Slackwoods NJ, Somerdale NJ,Somerset NJ, Somers Point NJ, Somerville NJ, South Amboy NJ, South Orange NJ, South Plainfeld NJ, South River NJ, Sparta NJ, Spotswood NJ, Springfield NJ, Spring Lake Heights NJ, Stratford NJ, Summit NJ, Teaneck NJ, Tenafly NJ, Tinton Falls NJ, Toms River NJ, Totowa NJ, Trenton NJ, Twin Rivers NJ, Union NJ, Union City NJ, Upper Saddle River NJ, Ventor City NJ, Verona NJ, Villas NJ, Vineland NJ, Waldwick NJ, Wallington NJ, Wanaque NJ, Washington NJ, Watchung NJ, Wayne NJ, Weehawken NJ, Westfied NJ, West Long Branch NJ, West Milford NJ, West New York NJ, West Orange NJ, West Paterson NJ, Westwood NJ, Wharton NJ, White Horse NJ, Wildwood NJ, Williamstown NJ, Willingboro NJ, Woodbridge NJ, Woodbury NJ, Wood-Ridge NJ, Woodstown NJ and Wycoff NJ!